A firefighter in Romania recently went above and beyond to save everyone caught in a fire in the city of Pitesti. According to Mashable, a 51-year-old man and his dog were pulled from the blaze. The owner had serious injuries and was rushed to the hospital. The dog collapsed from smoke inhalation shortly after being removed from the fire. 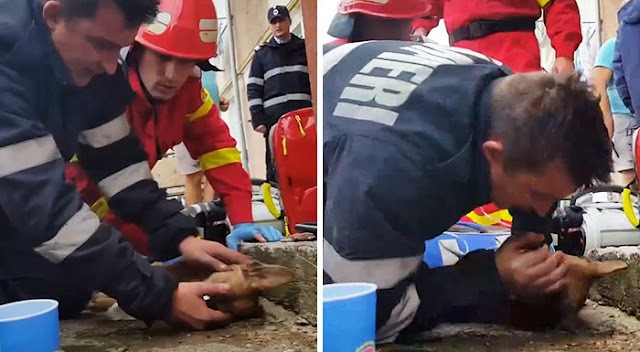 Firefighter Costache Mugurel saw the dog lying lifeless on the sidewalk and immediately rushed to help the animal. Following basic training, Mugurel started performing CPR on the pup. The firefighter gave mouth-to-mouth resuscitation and chest compressions until a oxygen mask was made available for the dog. The man’s quick thinking saved the canine’s life, and earned him plenty of praise online. But Mugueral appears to think of it all as part of his very important job description. After receiving assistance from the firefighter, the dog was taken to a nearby veterinary hospital, where he is said to be in stable condition. Responses to "Heroic Firefighter Fights For Dog’s Life By Performing CPR"